ISLAMABAD, Pakistan (CNN) -- At least six security personnel were killed and eight members of Sri Lanka's cricket team hurt -- including two with gunshot wounds -- in an attack Tuesday on the team's bus by gunmen in Lahore, Pakistan. 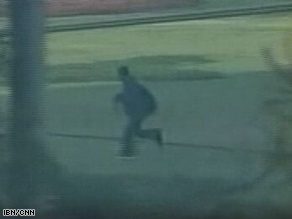 A video grab shows a suspected gunman near Gaddafi Stadium in Lahore, Pakistan, Tuesday. The Sri Lankan players were traveling to the city's Gaddafi Stadium for the third day of the second test match against Pakistan at around 9 a.m. local time (11 p.m. ET) when the attack occurred. Video footage showed several gunmen with automatic weapons opening firing on the convoy from a roundabout, Liberty Square, close to the stadium. Police said at least 12 gunmen were involved. Pakistani Information Minister Sherry Rahman told CNN the attackers were still at large. Witnesses described the scene as "pandemonium." Images showed police vehicles with their windscreens punctured by bullets and their front seats stained with blood. A body lies in the road in front of one bullet-shattered van. Up to eight players, one coach and 10 security staff were reported hurt, with two players suffering bullet wounds. Tharanga Paranavitana, 26, was hit in the chest while Thilan Samaraweera, 32, suffered a leg injury, according to Chamra Ranaveera, a Sri Lankan embassy attache. Both men are in a stable condition. "This is a very well-planned attack," security official Nadeem Sayed told CNN. "The team is very much scared." Cricket manager Charlie Austin, who represents six of the Sri Lankan squad, said none of the players' injuries were life-threatening. Sri Lankan Foreign Minister Rohitha Bogollagama said the squad would be flown home to Colombo later Tuesday. Bogollagama is traveling to Pakistan for talks with Pakistani President Asif Ali Zardari and Prime Minister Yousuf Raza Gilani. No group has claimed responsibility for the attack, but Sri Lankan officials have ruled out Tamil separatists, who have been waging a bloody civil war on the Southeast Asian island. Witnesses who saw the attack praised the response of security officials. "The guards were brilliant. They weren't panicking. They were very calm," sports producer Gavin Scovell said. "It must have been a terrifying experience, but they handled it well." "Our policemen rose to the occasion and laid down their lives to protect our Sri Lankan guests," said Pakistan's President Zardari. Last year Australia canceled a proposed tour in the wake of a series of suicide bombings. The International Cricket Council was also forced to postpone the high-profile ICC Champions Trophy after five of the eight participants pulled out. Pakistan is due to co-host the Cricket World Cup in 2011 with India, Bangladesh and Sri Lanka, although the extent of its involvement in that tournament now appears to be under scrutiny. John Stern, the editor of cricket magazine Wisden, said it was "not possible" to imagine international cricket taking place in Pakistan in the near future and described the outlook for the sport in the country as "desperate." He said one possibility was for the team to play its matches in the UK, which has a large Pakistani community. Former Pakistani Waqar Younis bowler said: "I don't see the International Cricket Council now allowing the World Cup matches in Pakistan. It's gone." "This has really damaged Pakistan," former Pakistani cricket player Zahir Abbas told Geo-TV. "Already some teams didn't want to come to Pakistan. Now who will come after this incident?" In a statement, ICC Chief Executive Haroon Lorgat said the attack was "very upsetting for the wider cricket family." "We note with dismay and regret the events of this morning in Lahore and we condemn this attack without reservation," Lorgat said. "I have confirmed with both member boards that the remainder of the tour has been canceled and we are working hard to get our match officials out of the area as safely and as quickly as possible." Sri Lanka agreed in December to visit Pakistan after India called off a tour following November's terror attacks in Mumbai. Indian authorities blamed the attacks on Pakistan-based militants. Pakistan's Cricket Board had hoped Sri Lanka's tour would help it recoup some of more than $16 million it was set to lose as a result of India's cancelation. The Sri Lankan offer to tour was a reciprocal gesture. Pakistan was one of two countries that agreed to play in Sri Lanka during the 1996 World Cup tournament after other countries refused to travel there because of security concerns over the country's civil war with Tamil separatists.